It was just another day during the summer holidays. We were working, editing, tweeting, facebooking and emailing. The children were declaring everything other than TV boring while we declared TV off limits. This led to some friction. Into the midst of this noisy and undiplomatic stand-off came Isabella MacDonald, one of the loveliest people we know and manager of the Kinloch Lodge Hotel. So, if you were a photographer and you were asked if you want to photograph food prepared by a chef with a Michelin star from recipes by an internationally recognised cook and food writer, how quickly would you say yes? I sat back and with all the savoir fare and coolness that a Glasgow Southsider can muster (and that’s a lot!) and smiled slightly. I gave a dry, laconic chuckle. Isabella looked concerned and slightly alarmed, she thought I was choking. Outside, I was reserved and laid-back, I should have been smoking a French cigarette and blowing quotations from Sartre in the smoke. Inside, I was jumping around the room shouting YES! YES! OH YES! Inside me also had my top over my head and was pumping fists in the air. Mrs L365 said yes we could do that, when would be convenient? I asked what happened to the food after the shoot. A date was arranged. A plan was made to farm the kids out, we didn’t want anything getting in the way and we got down to some serious anticipation. We are both keen foodies and the thought of being able to appreciate some excellent cuisine and photograph it was too much. Come the appointed day we turned up looking all high tech. We had decided to shoot tethered because we had seen Rankin doing it. No. That’s not true, we wanted to show Isabella and Marcello what was happening as it happens and having the camera connected to a lap top showing the pictures as they are taken is the best way to do that. It also meant that the laptop controlled the camera and we could achieve a much greater degree of focus and clarity than we would have using the eye piece. We weren’t trying to capture a fleeting moment. The food didn’t move around the plate too much. This wasn’t just to be arty shooting this was technical! 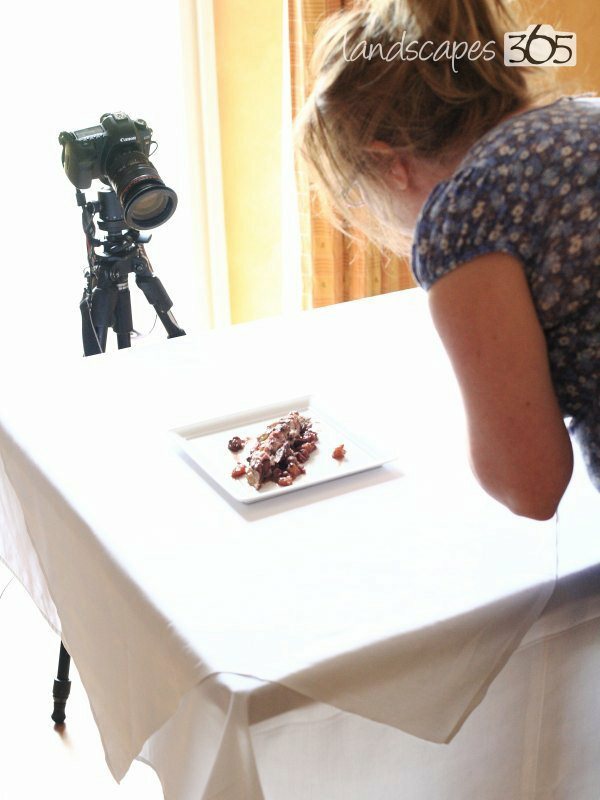 There are problems with food photography that you don’t get with say landscape photography. The landscape doesn’t tend to sag or shrivel or go curly at the edges, at least not as fast as a rapidly warming salad does. A sunset can disappear or fade but it doesn’t lose its shininess because it’s getting cold like a gently fried pheasant breast. Mrs L365 ponders a shot. As does the camera. There is something anthropomorphic about the camera. I’m reminded of WALLE. It’s about to look up at Mrs L365 and shake it’s head. We were shooting the food in Lady Claire’s large and airy demonstration kitchen which gave perfect natural light and plenty of room for cooking, cameras and computers. 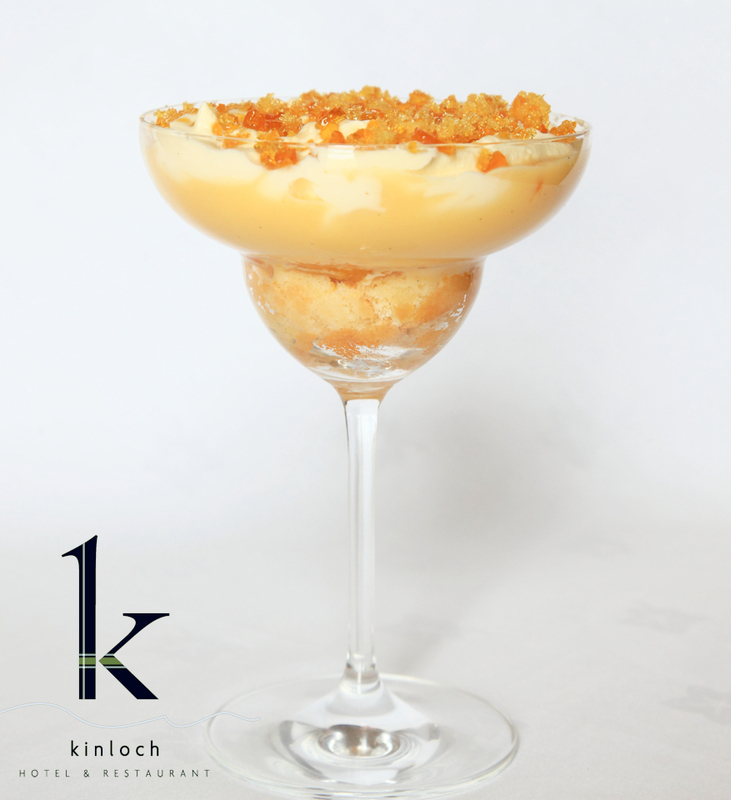 First up was an Orange Caramel Trifle. This was where I had a chance to really let fly with my skills. I held the table cloth up behind the trifle to create a white background while Mrs L365 took the picture and I think I did a pretty good job. It really makes the image. It was difficult to concentrate with Marcello working away in the same room as us. How often do you get the chance to watch a chef of his calibre in action? Actually it was not that exciting. No swearing, flamboyance or histrionics just calm efficiency. With no fuss he quickly created the next dish. Marcello Tully – Bringing all his Michelin star skills to pouring some hollandaise sauce into a gravy boat. The preparation of the seared scallops, with cauliflower puree and crispy pancetta sounded almost as good as it looked. The aroma was wonderful. It is strange to be calmly and carefully photographing something in a kitchen with all the attendant bangs, crashes and sizzles. Then it was the turn of a Roast Rack of lamb, with minty hollandaise sauce. The recipes are from Claire MacDonald’s new book “Lifting the Lid”. Telling the story of the 40 years over which she and Godfrey created the Kinloch Lodge Hotel. We were shooting some of the recipes from the early days of the Kinloch Lodge and their relative simplicity compared to today’s sophistication (or should that be complication?) has a lot to do with what was popular then but a lot more to do with what was available on what was at that time a very remote island. Lady Claire had to work with what she could get locally. Mrs L365 carefully places the Pheasant Breast with Orange and Chestnut for photographing, closely watched by the camera. Marcello points something out. Mrs L365 and the camera pay close attention. We were in our stride now and the plates swiftly appeared and disappeared in front of the camera. A Pheasant breasts with orange and chestnut was quickly followed by some Pork Fillet, with Apples, Leeks and Cider then a plate of Potted Salmon with Lemon and Walnuts. The final dish was a Gateaux Diane which received a great deal of attention due to its chocolaty attractiveness. Pork Fillet With Apples Leeks and Cider. You could say it is just roast pork and apple sauce but that would be an injustice, it is so much more than that. Potted Salmon with Lemon and Walnuts. A great deal of discussion went into whether the toast should be in the toast rack or not. It was a serious discussion which, looking back is a little surreal. With the cake photographed we were done. Now it was time to turn our attention to the sandwiches, coffee and shortbread that the Kinloch had provided. Did we mention that they are lovely people. We really need to say it more often. Once the sandwiches had been demolished we hustled the left-overs out into our car and zoomed (carefully – we didn’t want to spill anything) off to get the children from our friend’s house. We took the gateaux diane in to say thank you. The cake was put on the table then there was a blur of kids and spoons and we were left with an empty plate with nothing but a smear of chocolate on it. Here is a link to lady Claire MacDonalds new book “Lifting the Lid” Mrs L365 did the cover photos! Mark/Your Kitchen Camera - Great Post! It’s an interesting take, shifting gears and having to tackle another side of photography. I can’t even imagine trying to switch gears and having to shoot a landscape. I really enjoyed the writing of the post as well, effortless and flowing.